Turning Fifty Can Be Nifty! The 50th birthday gift basket has many favorite candies from the year 1963, but with a twist. The twist is that both the giver and the recipient will experience instant nostalgia, transporting them back to a time when life was filled with simple pleasures. The candy collection is a blend of rare oddities, some of which are no longer commercially available such as candy buttons on paper, Zotz Fizzy candy, wax lips, and candy lipstick. The gift basket is a perfect unexpected gift for a surprise 50th birthday celebration, no more rushing around trying to locate something special. The 50th birthday gift basket is a convenient present, because it’s already beautifully wrapped. The only thing that will be more of a surprise is the number of smiles that will appear watching the gift basket being opened for the first time. There’s a place inside of our hearts that we reserve especially for fond memories, and that’s the appeal of this gift basket. It brings back the sweet memories of childhood; the candies represent a time of innocence, when every day was an adventure full of laughter, friends and dreams. There’s enough candy to share in a party environment or for an out of state recipient to collect and store in a vintage jar. Everyone needs a gift basket like this when turning fifty. Because when it comes down to it, turning fifty is a milestone; it’s a wonderful birthday present for a person to open and suddenly realize that they’re allowed to cut loose and let their inner child run free. Most importantly, the 50th gift basket is a combination of two things, a sense of whimsy, and a sense of history. It looks pricey, but the basket is reasonably price at $34.95, which makes it an affordable way to tell someone that you think that they’re special and deserving of a unique birthday gift. There are no real themes for a fiftieth birthday party; most people feel that it’s best to keep things simple. You can throw a very special party without breaking the budget; the gift basket adds a simple but sweet touch to any celebration. The best gifts are ones that are about family and friends. These candies are connected to the past but also have a modern touch for the younger generation. Most people at this age have kids and grandkids. 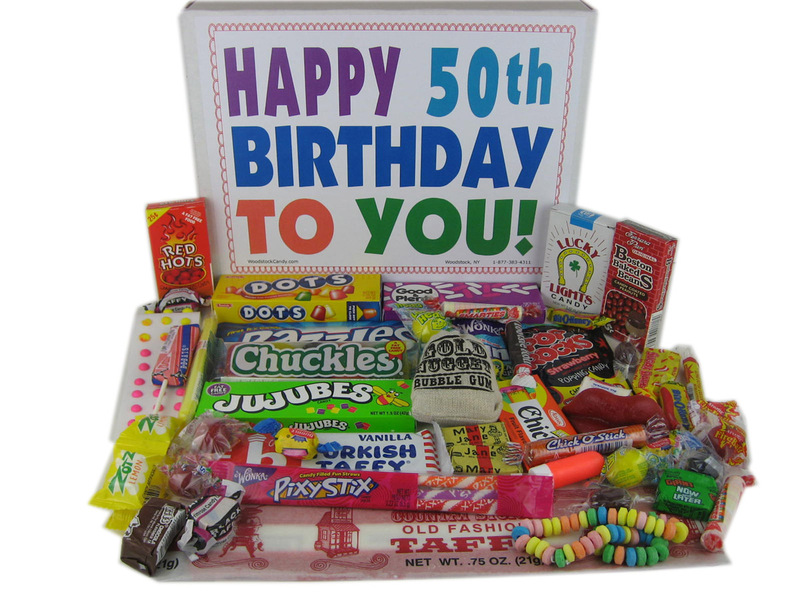 There are candies that they can enjoy and recognize today, these include Smarties, Atomic Fireballs, Sugar Daddies, Lemonheads, and Red Hots. For anyone looking for a great gift idea, this one is a rare treasure. Besides the nostalgic appeal, it is a nice to share memories with the younger generation, by telling stories connected to the individual candies. This gift basket is sure to become the conversation piece at the party. Included with purchase is a free cellophane baggie of individually wrapped candies, great to share with guests. Nobody wants to think about getting older each year, but with a gift like this, no one will mind.